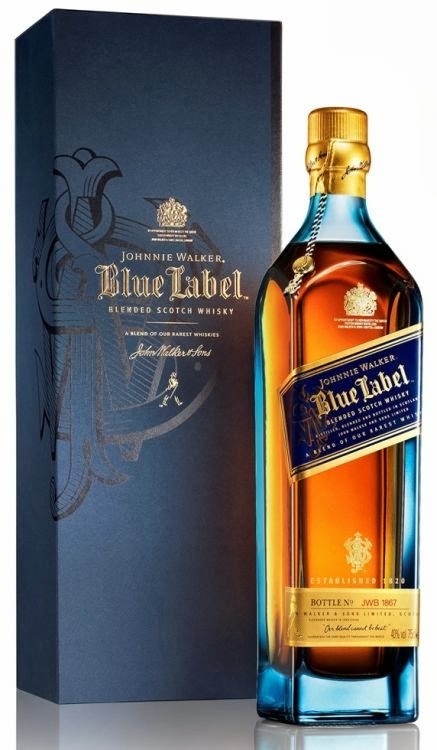 Johnnie Walker Blue Label represents the pinnacle of the Johnnie Walker range, as it sits at the very top of the hierarchy above Platinum Label, Gold Label Reserve, Double Black, Black Label and Red Label. The Gold Label and Green Label have now been discontinued. Blue Label is being re-reviewed because of the phenomenon of “batch variation”. This means that a whisky, year after year, may change in character because its character depends on the oak casks in which it matured and no oak cask is the same. This means that a whisky comprised of whisky from different oak casks may have different character, even if the whisky is blended to achieve a particular flavour profile. The last Blue Label I reviewed was from the late 1990’s or early 2000’s. This Blue Label sat on the shelves in 2013. You can find my review of the old Blue Label here. Johnnie Walker have done a superb job at retaining the flavour profile of the Blue Label, keeping it consistently malty with some classic House of Walker smokiness. The 2013 bottling is super smooth, and offers what the older bottling lacked: a lingering and mouth-watering finish. The old Blue Label fizzed with its finish, whereas the 2013 Blue Label ignites the palate and its character remains like a warming glow that progressively intensifies – lovely lovely lovely! The 2013 bottling. however, has a slightly less interesting nose with the peat cloaking some of that lovely maltiness I have come to adore in Blue Label. Nose: Malty, with some smoothing vanilla counteracting the sparks of peat and flecks of barley that ignite in the backdrop of candied fruit and mixed herbs. The peat is more pronounced in this bottling, and as noted it takes over some of the maltiness. Slightly uninteresting. Taste: The whisky strikes the palate with bravado, waking up the taste buds in a ride shock – that was not expected from the subtle aroma on the nose. The peat, very mild and gentle, intermingles with ripe plums and dates and the characteristic maltiness looms but never really takes hold. Finish: Ohhh baby. This is nice whisky! The buzz of the barley and grain radiates with the fruit and shades of peat. This entry was posted in Blends. Bookmark the permalink.